Home/EYE EXAMINATION, Tips/Is It Time To Take Your Child To The Eye Doctor? WHAT ARE THE SIGNS THAT IT’S TIME TO TAKE YOUR CHILD TO THE EYE DOCTOR FOR A SIGHT TEST? Small kiddos cannot really tell their parents when there is a problem with their vision. If it is a condition that has always been present, then it is their normal and they have nothing to make a comparison with. Parents take their little ones for wellness visits with their pediatrician, and are excellent at bringing them to see their dentist when there is no evidence of an existing problem. 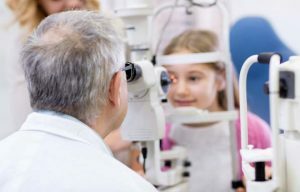 However, they wait for an obvious problem to arise, such as myopia or nearsightedness for example, to take the kiddos to the ophthalmologist for an eye exam. Early detection is key in maintaining healthy eyesight before the eye strain worsens any conditions. Approximately 60% of parents wait until their children tell them they’re having vision trouble before taking them to the eye doctor. A child’s lack of interest in participating in detailed activities, such as crafting, coloring, or completing puzzles, can be indicative of poor eyesight. Although they may have the motor skills and dexterity to do all of these things, it stands to reason that if their eyesight is poor, they will not have an interest in doing them. Your child may complain of headaches. Of course, headaches can be attributed to many health conditions, however, daily eye strain will cause headaches, irritability, and difficulty sleeping. The inability of a child to see details clearly may attribute to a child’s clumsiness. The child may bump into inanimate objects, or trip and fall, for lack of clear vision. Another sign your child’s eyes need to be checked is his/her inability to focus or open their eyes widely in a brightly lit room or in the glaring sun. Should your child be somewhat coordinated but lack the ability to perform tasks requiring hand eye/foot coordination, his/her vision should be checked by an ophthalmologist. To make an appointment to have your kiddos vision examined at West Side Eye Clinic, you can reach us at (504) 347-8434. For more information, you can submit a request at info@westsideeyeclinic.com. We are located at 4601 Wichers Drive in Marrero and are at your service Monday through Wednesday from 9am – 5pm; Thursday and Friday from 9am – 4pm; and by appointment only on Saturday.